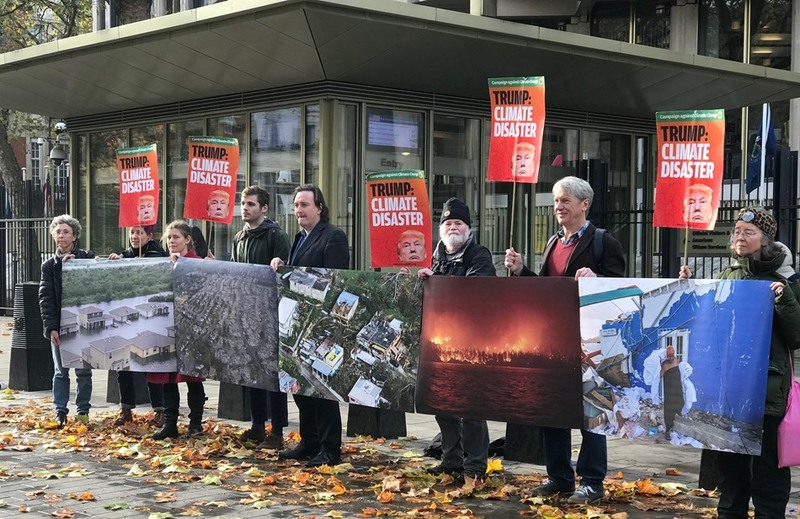 At the current UN climate talks in Bonn, news has broken that Syria (following Nicaragua) will be signing the Paris climate deal, leaving US isolated in its intention to leave. 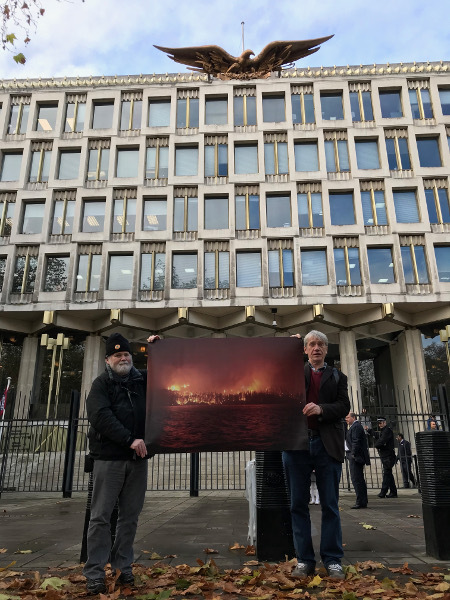 To mark one year since Trump's election, we went to the US embassy with a reminder of the consequences of inaction on climate change. 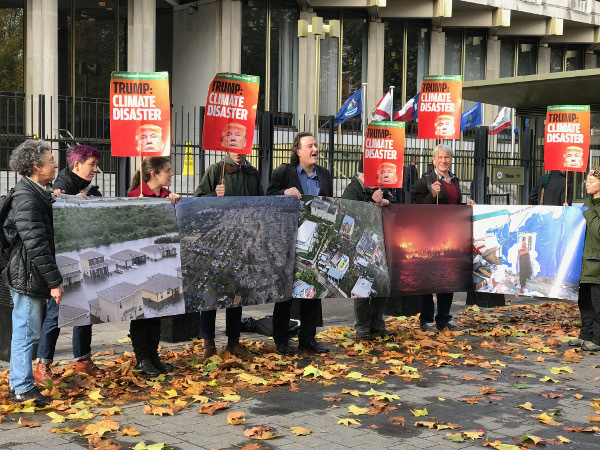 The images from recent climate-related disasters wildfires in California and British Columbia, of devastation from hurricanes across Caribbean islands and of flooded Houston show just a few of the impacts of climate change we are seeing now. From melting ice sheets at the poles to scorching drought in East Africa, our climate is destabilising fast. 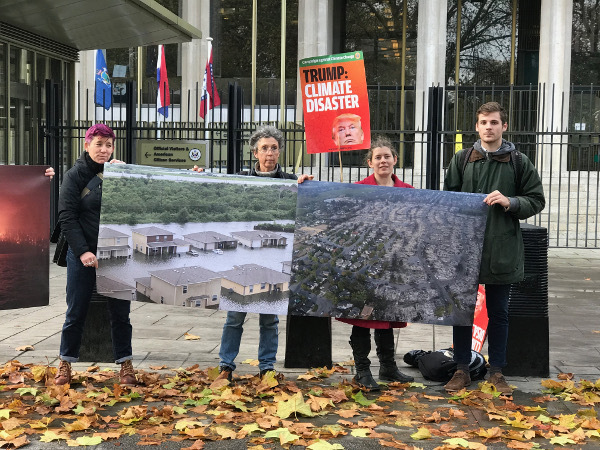 Trump's actions are set to usher in a much greater toll of human suffering and ecological devastation through climate change. One thing is clear - we cannot let him do this, nor can we accept half-hearted responses from other governments. Join us for a simple action to mark our solidarity with those affected by climate change today and call for urgent action. Flooded homes in Houston (August 2017) after Hurricane Harvey, which caused 91 deaths and estimated almost £200 billion dollars damage. Abnormally warm ocean waters contributed to Harvey's extraordinary moisture load, many areas receiving over a metre of rain in four days. Houses burned to the ground in Northern California (October 2017). Summer drought and heat contributed to record wildfires that killed at least 43 people. Damaged houses in Puerto Rico after Hurricane Maria (September 2017). The hurricane devastated the island, with the majority still being still without power two months later. The official death toll has been challenged by the mayor of San Juan who stated that a figure of 500 would be more accurate. Wildfire in British Columbia, Ashcroft Reserve (July 2017). Again, drought and heat contributed to a record wildfire season. Woman in front of a damaged building on St Maarten after Hurricane Irma (September 2017).